I headed up to Hartford Saturday morning for NEMBA's National Trails Day activities at Riverfront Park. An interesting place to say the least; with a tight, flat series of trails in which you can eek out a 2.5 mile ride and see the whole place. There are paved trails to the south but who wants to put knobbies on pavement? Oh and by the way, sorry for the poor map quality but Garmin and I have a little disagreement on the quality of their code/QA in their last Mapsource build. When I try to convert from Garmin proprietary format (*.GBD) to a *.GPX file, the app crashes and doesn't create the file. Like any software company/Help Desk they always blame another app running at the sametime because of their poor quality control. A few people showed to the event and we got some work done. 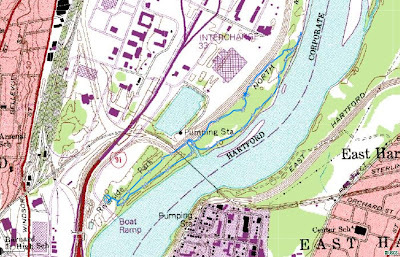 I was surprised that there weren't more, like folks from CCBA and The Beat Bike Blog, afterall we are putting on the Hartford 'cross race together (with CT NEMBA). The event was posted on The Beat but not on CCBA - guess somebody flatted on that connection. Presented by the Central Connecticut Bicycle Alliance and CT-NEMBA, Cyclocross returns to Hartford this October at Riverside Park. Enjoy the picturesque setting next to the Connecticut River while wallowing in the mud and take in views of the Hartford skyline as you trudge up the 40 foot high levee. Afterwards we did a few laps. 34:19t was overkill. This is definitely 42:15t country. 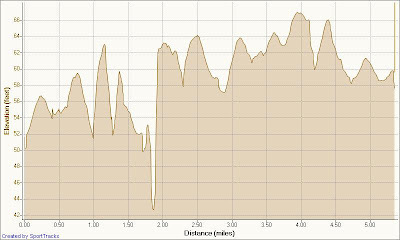 If the race includes the levee then I might go to a 34:15 or 14 combination. Also learned a valuable lesson. That morning I threw on a different tire on the Qball and they while riding I noticed it was sort wobbling but thought it might the true issues I was having. Halfway through the ride my tire came off and shredded the tube. Fortunately, I had a spare and made a quick change. The earlier wobbling was indication that the tire wasn't seated properly.